TV presenter Jasmine is a former fitness instructor and a current Veganuary Ambassador. When asked about her favourite meal, she singled out this all-time British classic but with her own delicious Mediterranean twist. 1. Sauté the mince in the oil for five minutes so it doesn't go soggy. Then, add the onions, garlic and mushrooms, and let it cook for another five minutes, stirring every now and then to ensure it doesn’t stick. 2. Add everything else. Bring to the boil and let it simmer uncovered for 20-25 minutes until it has reduced a bit. The final consistency should be thick but not dry. 3. Make the mashed potatoes by boiling the potatoes in water for around 20 minutes until they are soft but not falling apart. 4. Drain, add the milk, mayo and margarine, and mash until they nice and creamy, not crumbly. 5. 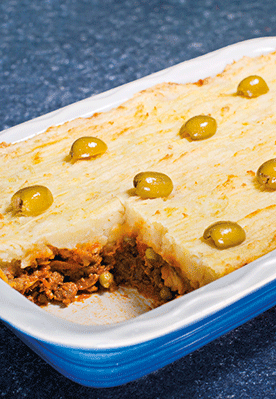 When both are ready, put a layer of mince in a baking dish and then cover with mash. Fork it over so it covers the mince evenly. You may also brush the top with a little bit of olive oil to give it a nice crisp, then pop in the oven until golden. 6. Around 30 minutes at 180°C should do it but add slices of vine-ripened tomatoes or olives to the top halfway through.